“Can we call the president?” a child asked senior Courtney Tee (’17) on her last day at his school. In 2015, Tee was researching 20 fourth-graders who were rallying against child abduction at their school in South Dallas, Texas. It was so important to them, they thought then-President Barack Obama should know, so they wrote letters to him describing their efforts. Two years later, Tee didn’t call the White House, but she did present her research to members of Congress, including the representative for the district where the children lived. She presented at Posters on the Hill, a national undergraduate research event in Washington, D.C., on April 26, 2017, when she met other researchers and policy advocates. She said she did it for the students in South Dallas and because she knew their story needed to be told. Tee’s success came at the price of sacrificing a traditional sophomore year in Abilene to study social issues in a community 180 miles away. She joined the Justice and Urban Studies Team (JUST), a group of Honors College students at ACU at CitySquare in Dallas, Texas, for two semesters studying urban poverty. Tee grew up in a middle-class family in Houston, Texas. Although her circumstances made it easy not to think about poverty, she developed a passion for justice and chose to study sociology at ACU. She put theory into practice with JUST’s cornerstone project, partnering with a class of fourth-graders in the international Design for Change program that teaches students how to build their own character by creating a solution for a problem they see in their community. In her research, Tee found this helped the fourth-graders take hold of their education because they felt they could do something to make a difference. It also helped them learn problem-solving and behavior-management skills: At the end of the year, they presented an hour-long rally for their school without help from adults. A key research finding for Tee was that the children no longer saw themselves as kids in a struggling school, but instead as difference-makers in a major U.S. city. Tee returned to Abilene for her junior and senior years and stayed heavily involved in campus life. She directed two Sing Song acts and was a production manager for Freshman Follies. She also helped with Justice Week, served as a resident assistant in a residence hall and joined several academic clubs. She minored in Bible and public service and received a Jack Pope Fellows scholarship. The summer after she lived in Dallas, Tee studied abroad in England, Spain and Ghana as part of the Justice Along the Meridian program. While in Spain, she met a Catholic monk who had degrees in quantum physics, philosophy and theology. Tee focused on her passion for justice by remembering the words of the monk. “What is the work of God in the world?” Tee asked him. His words stayed with her when she heard about Posters on the Hill, an event hosted by the Council on Undergraduate Research. She remembered the hope of the fourth-graders in South Dallas and decided to submit her research paper to the conference. 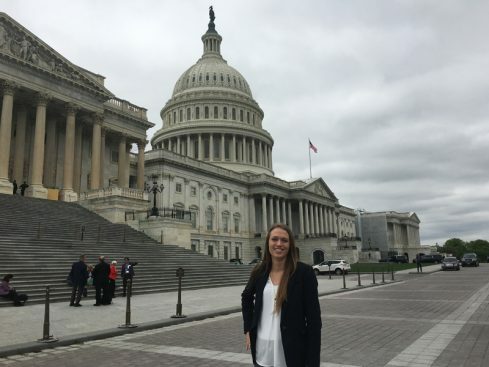 While she was at the Capitol, she met congressional representatives and policy advocates. She told the story of the young world-changers as she presented her poster in the Rayburn House Office Building. “Stories of hope never go out of style,” she said. Tee graduated in May and works with Teach for America, serving at YES Prep Southeast in Houston, teaching high school social studies, coaching varsity volleyball and looking for the next class of students ready to change the world. View more from Haley Remenar.